Can You Figure Out What Makes This Watch "Video Game-Inspired"? 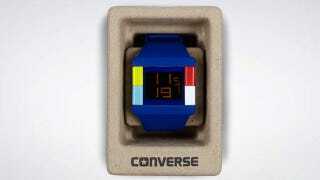 Joel: I honestly cannot see what makes this Converse watch "Video game-inspired"
Fahey: Well it's got....um. There's the... I got nothing. Joel: That's about it maybe. Joel: It makes me wish I'd paid $75 to buy a new game instead of that crummy watch. Fahey: The red and white is Ken and Ryu, duh. Joel: Maybe it's supposed to be Sonic's hand when he's got the flu and he's trying to decide what pill to pop?